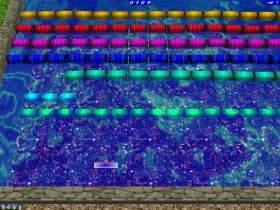 Caiman free games: Aqua Breakout by Simon Brown. 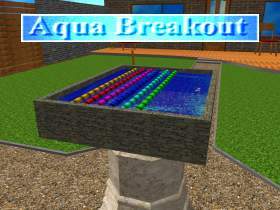 Aqua Breakout is a Direct3D version of Breakout, features a water theme, with realistically animated real-time water, floating barrels and ball which react to the water, and a garden surrounding the game arena. By the test I became nuts from the glittering water. Aqua Breakout is een 3D versie van Breakout (arcanoid) in een bak met water die in een tuin staat.